If you've not heard of NICA before, this is what you need to know: The National Institute of Circus Arts (NICA) is Australia's Centre of Excellence for training in contemporary circus arts. 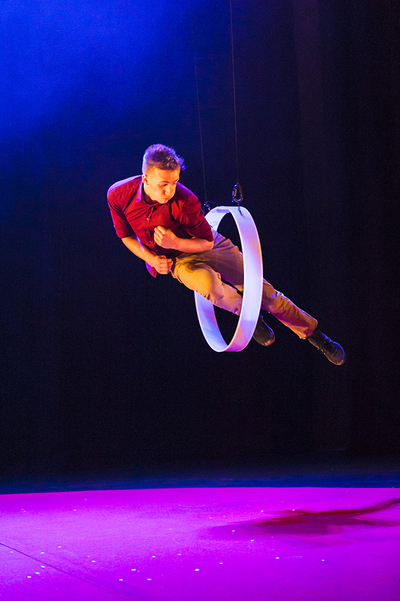 NICA offers Australia's only Bachelor of Circus Arts. The course attracts a wide range of applications from around the world, and many NICA graduates move into exciting careers within the circus arts industry. We're not shy in promoting NICA's Graduate Showcases and all for a very good reason. Graduate performances are always fantastic; there has yet to be a show we've not enjoyed in the three years we've been reviewing NICA's Showcases. Such performances often err on the quirky side of circus arts, but are always highly entertaining, thought provoking and do what they do best; showcase the incredible and diverse skills of NICA’s final year circus artists. PLEASE HOLD directed by acclaimed Kate Champion, we've interviewed rising circus star and recent graduate Nelson Smyles. At the age of just 21, Nelson has recently been accepted into Cirque du Soleil. Nelson Smyles. Photography by Aaron Walker. Q: Did you always know you wanted to work in physical arts/circus? One pre-audition workshop, my first real audition and three years of training later - here we are. And I’m the happiest I have ever been. Q: How does it feel to be accepted into Cirque du Soleil at the age of just 21? Was this the ultimate dream for you? It’s actually mind blowing. It was always that unrealistic goal we would all laugh off because no one in my year thought it would happen. So now that it has actually happened I’m still shocked. Incredibly excited, but so shocked. The tour is throughout America for 2018. I start in Montreal to learn about the show costuming and make up, and then I fly out to LA to join the rest of the cast. Q. Is it difficult to be accepted into the largest theatrical producer in the world? What did you have to do to be accepted? I missed out on the most difficult part of joining Cirque du Soleil. The auditions are held in Montreal every year, and last year talent scouts came to Australia to hold auditions here. I didn’t go because I didn’t feel like I had even the slightest chance. I then proceeded to send them a few videos that I had made over the years and one day I woke up to an email with them asking me what my availability was like for next year. Q. How did you find your “niche” in circus arts; what lead you to hoop diving and clowning? Clowning was my first choice because I always loved performing and making people laugh. Hoop diving started out as a way to continue training in tumbling, but then evolved into something that I have become really fond of. Q. Circus is an art form going back centuries, but I’m sure there have been changes to circus performances over the years. What would you say has changed most in circus arts from the beginning to now? The biggest thing that I am excited for in the upcoming circus world is integration between circus and theatre. I’ve seen a few brilliant examples of shows doing this and it’s proving to be really interesting to break away from the traditional style of circus. Q. I use the term loosely but how much ‘free time’ would you envisage you get when you aren’t training or performing, and what would you do with your ‘down time’. There is time in the mornings before training and afterwards in the afternoon. When things are really busy like they are now with full time rehearsals, almost all of my afternoons are spent conditioning and training because we don’t get much time to do it during the day. But when things are a little quieter I really enjoy visual arts, specifically drawing and painting. My mum is a painter and I have been sketching for longer than I have been tumbling. Q. What can we expect from the NICA Graduate Performance of PLEASE HOLD? I think the performance is going to be incredible. Our director Kate Champion is doing things with circus that I haven’t seen before. For example, we are taking elements of traditional circus apparatus and adapting them to the style of the show. We’re also exploring what an ensemble can do with materials that haven’t been used before in circus. I am really enjoying being part of that process. Follow Nelson's journey on Facebook HERE and see him perform in National Institute of Circus Arts's (NICA) newest production PLEASE HOLD from 29 November – 9 December. Directed by Kate Champion, Please Hold delivers a range of high level circus skills from competitive hand balancing and intricately coordinated tumbling, to extreme flexibility and highly tuned acrobatics. With humour and insightful observations, Please Hold will dig into the impulse that drives these young adults to shun a 'normal' life in pursuit of something rare and exceptional. Where: NICA National Circus Centre, 39-59 Green Street, Prahran. When: 29 November – 9 December 2017.